Spray 2- to 3 1/2-quart slow cooker with cooking spray. 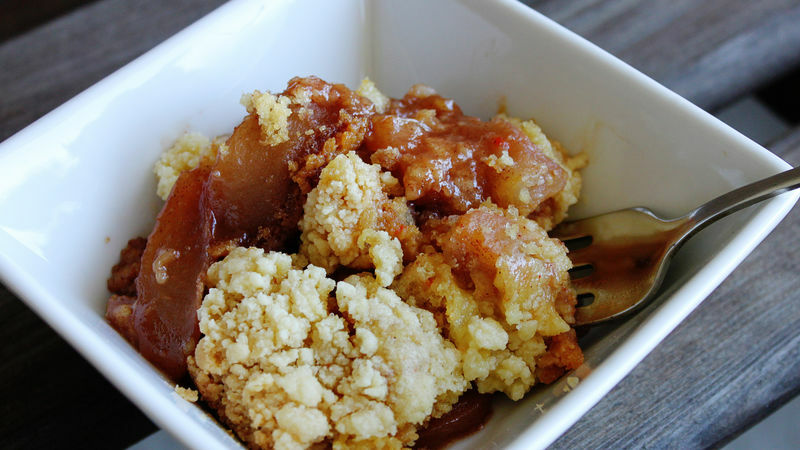 In large bowl, toss apples, granulated sugar, brown sugar and cinnamon. Add to slow cooker. In medium bowl, mix melted butter and dry cake mix. Sprinkle on top of apples. Cover; cook on High heat setting 2 to 3 hours or until apples are soft, removing cover for last 30 minutes of cooking. You can also add 1/2 cup of butterscotch schnapps to the apple mixture to make this boozy! You can place 3 or 4 paper towels under the lid of the slow cooker to absorb some of the moisture while cooking. You can use unpeeled apples – red peels will add a rosy color and extra fiber.